Citing commitments to his club team, Jesus Padilla has declined US Soccer's invitation to join the latest U-20 camp and to play Argentina's U-20s at PAETEC Park on May 15th. Padilla has been replaced on the US roster by UCLA midfielder Sal Zizzo who was a part of the US U-20 team during qualifying for this year's U-20 World Cup in Canada. US U-20 Head Coach Thomas Rongen is scheduled to be a guest on Kick This! on Saturday, so we will likely get his take on the loss of Padilla, amongst other things ahead of the Argentina game and the U-20 World Cup. Fox Soccer Channel got some goals for their USL Game of the Week. Machel Millwood had a goal and an assist and Dan Antoniuk had two assists as the host Silverbacks took three points from the Thunder. Former Rhino David Hayes played the full 90 at left back for Atlanta. Former Rhino goalkeeper Patrick Hannigan got the win in his debut for Miami FC. Miami FC was able to come back from a 2-1 second half deficit with goals from Eric Vasquez and Luchi Gonzalez. Ian Fuller and Charles Gbeke scored two of the three goals that were scored in the first 8 minutes of this high scoring match up of two playoff teams from 2006. Mauro Biello started up top for Montreal opposite Gbeke, Gabe Gervais played the full 90 on defense for Montreal, and Dusty Hudock took the loss in goal for Charleston. For the second week in a row, the RailHawks were able to host a team that had played the night before on the Fox Soccer Channel Game of the Week. But, for the second week in a row, the RailHawks were only able to get 1 point out of the match. David Hayes once again went the full ninety for Atlanta. The RailHawks started former Rhinos in Chris Carrieri, Connally Edozien, and captain Frankie Sanfilippo and Jonny Steele came off the bench as a second have sub for McColm Cephas. 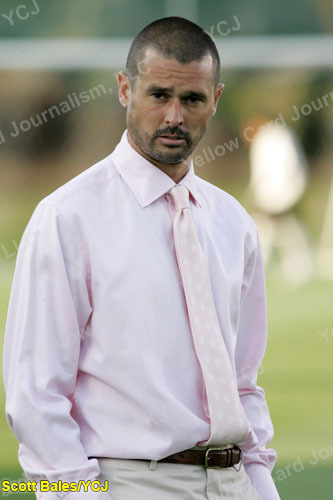 I also have to say that head coach Scott Schweitzer was sporting a nice pink tie. The California Victory had an impressive result in their first match in club history as they were able to travel north to take on the defending champion Whitecaps and were able to leave with a point. Former Rhino Eddie Sebrango opened the scoring for Vancouver in the 3rd minute, but California scored the next two. It was another former Rhino that was able to get the hosts a point as Martin Nash scored in the 69th minute to even the match at 2. Roberts Wesleyan grad Richard Goddard made his Vancouver debut as the Whitecaps back up goalkeeper. Noah Delgado was a second half sub in this scoreless draw. - Former Rhino Carlos Mendes was the Big Apple Soccer.com player of the week for his performance in the Red Bulls 1-0 win over FC Dallas on Thursday. - Former Virginia Beach Mariner forward Nicholas Addlery scored twice in a reserve match for DC United according to Steven Goff. With Goff expecting that Addlery could nudge Rochester native Jamil Walker out the door, this can't be good news for Jamil's future with DC. - It's still early, but it's looking like MLS' Eastern Conference is a lot stronger than the West. The East features two unbeaten clubs (NY and Chicago), while the West doesn't have a team over .500 and the team with the most points (FC Dallas) has a losing record (2-3-1). Although, who knows what will happen once the Gold Cup, Copa America, and the U-20 World Cup starts pulling players from MLS rosters.